This Tri-Fold Album is in Excellent to Like-New Condition. Great Collectible. Issued in 1993. I had 12 of these factory sealed. I opened one to photograph. Brand new in original packaging Franklin Collector Series soft strike baseball. Commemorates 1993 MLB All-Star game on July 13, 1993. Ball is waterproof, hand stitched synthetic leather cover with a soft molded vinyl core designed for safer play. Package has some creases and cracks but does not affect condition of the ball. Please see pictures for condition and email me with any questions or for more information. Inaugural limited edition silver coin #2810. Inaugural Season schedule. 30 supergloss photo cards. In original sealed box. 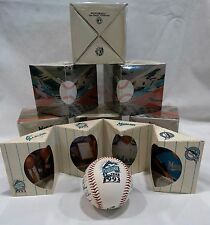 Florida Marlins 1993 Inaugural Year Limited- Edition Baseball with Box SEALED!!! Inaugural Florida Marlins 1993 Team Baseball w/ Facsimile Signatures. FIRST 6 PICTURES IS THE ACTUAL PRODUCT. THIS PRODUCT HAS NEVER BEEN OPENED! & shadow box. inside the unique shadow box is 4 pictures. Spinneybeck leather Baseball of the team shown above. Baseballs have been in storage in smoke free, pet free home. See my other auctions as I have one of every team that was in existence at the time. Contact seller with questions or additional picture requests. Each baseball comes with original box and accompanying wooden pedestal block for display. No returns so bid with confidence. (SIGNATURES ARE FACSIMILE. NOT ACTUALLY SIGNED BY THE PLAYER). NICE CONDITION. This is a rare find. This Crystal Bat was available during the Miami Marlins inaugural season in 1993. 1000 of these unique crystal bats were made. This is #361 of 1000. 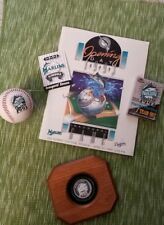 Marlins 1993 Inaugural year ball. '. A season of firsts' stats printed on back. New in plastic. Baseballs may have varying degrees of toning due to age. SIGNED BY THE 9 STARTING PLAYERS ----- - APRIL 5, 1993. PHOTOS ARE OF THE BASEBALL YOU WILL RECEIVE . 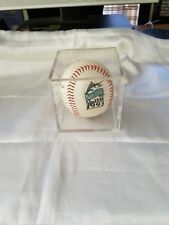 Florida Marlins 1993 Inaugural Year Limited Edition Baseball with Box SEALED!!! NEVER OPENED. SEALED IN BOX. MARLINS VS DODGERS LIMITED EDITION. BALL READS JOE ROBBIE STADIUM. LOGO UNVEILING DATE. OWNER WAYNE HUIZENGA. Imagine one of their autographs below the World Series logo. This is a sale for a100% authentic 1993 RAWLINGS OFFICIAL WORLD SERIES baseball between the Toronto Blue Jay and the Philadelphia Phillies. NOLAN RYAN FOTOBALL BASEBALL ONLY ! Nolan Ryan played for the o 1989 to 1993 -- Texas Rangers. This item is in. o 1980 to 1988 -- Houston Astros. All content has been protected and is in Mint Condition. This beautiful collector's piece contains Limited Addition 1993 Inaugural Year Florida Marlins Baseball. Over 20 signatures. price is per ball. RENE LACHEMANNN, MANAGER. WAYNE HUIZENGA, OWNER. Stand and ball are in great condition. Machine Signed. Excellent condition. Philadelphia Phillies Original Team. Machine signed. In Excellent condition. Signatures are clear and vibrant. The signature rates an 8/10. The ball itself is lightly toned throughout with a minor stain. The signature is authenticated by a Notary Public who witnessed Jeffrey Blauser signing the baseball in front of him on May 31st, 1993. A GREAT ADDITION TO YOUR BASEBALL COLLECTION. The ball is still sealed in the original box! TERRY STEINBACH. OAKLAND A's ATHLETIC COLLECTIBLE PHOTOBALL. TEAM STARS 1993. THE BALL IS IN VERY GOOD CONDITION. BALL HAS PRINTED FACSIMILE AUTOGRAPHS OF 1993 TEAM. BALL IS STILL SEALED. Brand new mint in package 1993 commemorative all star game baseball! All in mint condition as have been kept in covers and/or factory wrap. Preowned, excellent condition in plastic cube. Colorado Rockies Inaugural Baseball with case. Item sold as reflected in photos. UP FOR GRABS I HAVE AN OFFICIAL 1993 WORLD SERIES RAWLINGS BASEBALL. Baseball has been in enclosed holder so in excellent condition. Some of the autographs are Ozzie Guillen, Bobby Thigpen, Kirk McCaskill. See photos for all names as I tried to get every angle. If you have any questions, please do not hesitate to contact me. In original and unopened clear plastic packaging. Commemorate official size and weight baseball featuring 1993 official All Star Game logo "Baltimore Orioles 1993 All Star Game" Also includes "64th Midsummer Classic July 13, 1993". Game played at Camden Yards. Manufactured by Fotoball. BASEBALL "FLORIDA MARLINS MLB 1993" SEALED IN BAG, ORIGINAL FROM STADIUM! ORIGINAL FLORIDA MARLINS BASEBALL, 1993, SEALED IN PLASTIC BAG. OF RICH INDUSTRIES MLB 1993. Ball is in Mint Condition. We're very easy to get along with. BY FOTOBALL. WOULD MAKE A GREAT GIFT FOR THE DIE HARD MARLINS FAN. A UNIQUE NEW SYNTHETIC "GRANITE" LEATHER BASEBALL WITH BLACK STICHING. OFFICIAL SIZE AND WEIGHT. NEVER BEEN OPENED. Very good condition Franklin July 13th 1993 Baltimore Orioles All star Baseball collectors edition.